Decided to retex Sylvanas to make her look a bit more like Bliz's current portrayal of pre-undead Sylvanas. 1.2 now includes the regular texture, along with a lowrez 256x256 and Blood Elven version. Pick your poison. I probably won't be updating this anymore in the near future unless I really need to or someone suggests something that I should add or fix. - 1.2 (10/15/16): Redid most of the face (redid nose, defined hair a bit more, lightened lips, redid eyebrows, various other small shading fixes), changed the tone of the armor from sapphire to cerulean, redid shading of the bow's orb, added lowrez and alternate Blood Elf options. - 1.1 (9/25/16): Redid gem on her gloves, redid her eyes, added an orb on the end of her bow, redid eyebrows, added armor onto legs, fixed shading on bow. - 1.0 (7/14/16): Initial release. That would be nice. You should use this skin as a reference :fp:SylvanusWindrunner_by67chrome.blp only for the eye balls Without eyeballs she looks like a zombie. The idea is awesome, what i'm not that sure is the lack of the spheres in the bow. The weapon looks smaller thanks to the weapon glow, but i think is minor. This is nice, I somehow like the way you do it. Smooth. 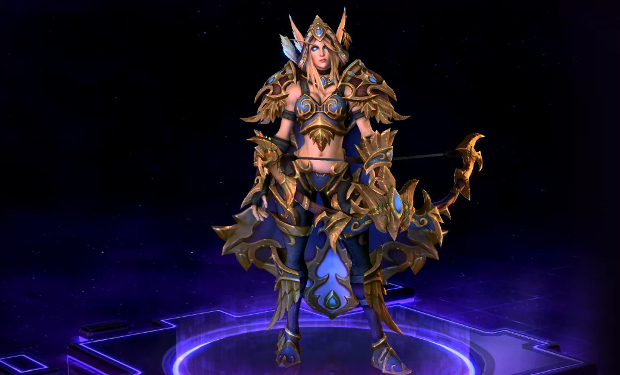 I know you want to achieve the look of Sylvanas but some details on the boots, pants might be good. Normally I would suggest strengthening the highlights a bunch, but seeing as the thematic of the texture works out quite well for the model, I'd not push it. I like it quite much mate. Well done, truly a HotS look there. Could make it more high elf looking? How so? I could give her eyeballs maybe? Without eyeballs she looks like a zombie. The skin of the character is well reflected and spread around giving a genuine HotS feel to it. Colors are warm and complement each other adding a nice touch to it. Shadows and highlights are quite good in-game and contrast is quite good even if it could've been more pronounced. Good job overall and keep on texturing! Beautiful skin, only notes I'd say is just blending out the eyebrows a little more they look too square and perhaps add some eyeballs! Other than that, looks simple but fantastic, I'm surely going to use it! Now it looks way much better. A fitting icon for it would be nice. I like it needless to say.